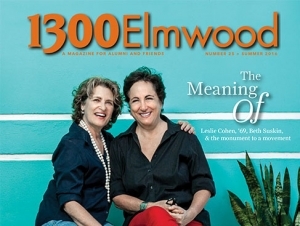 The summer 2016 edition of 1300 Elmwood, the magazine for SUNY Buffalo State alumni, is now available in print and digital formats. Read the current issue to get updates on your alma mater, catch up on fellow alumni, and learn how Buffalo State continues to transform lives. Along with campus news, faculty research profiles, and donor/alumni interviews, 1300 Elmwood includes stories that celebrate Buffalo State’s past, present, and future. Leslie Cohen, ’69, and Beth Suskin, who met at Buffalo State 50 years ago, are immortalized in America’s first national monument to the gay rights movement. Insights from Buffalo State’s Golden Globe-winning writer and producer of Mr. Robot. A fascinating look at the man who verified the largest buried treasure of coins found on American soil and a rare Billy the Kid tintype. After winning a $1 million international teaching award, this alumna donated her prize to the innovative demonstration school that she founded in 1990. Donor impact profile: Eleanor Murray’s gift will preserve the Studio Arena archives. Faculty research profile: Carol DeNysschen is researching life after cancer. Scholarship profile: Saša Vann, ’16, races to honors, accolades, and graduate school. The online edition allows 2.0 sharing options, as well as the ability to comment on articles. Subscribe to the digital edition today!